Come on Lottie, you wanted to get into the attic today and the snow is falling, I much rather go outside to play!. Waking up dolls, first thing in the morning, is one of my favourite things. 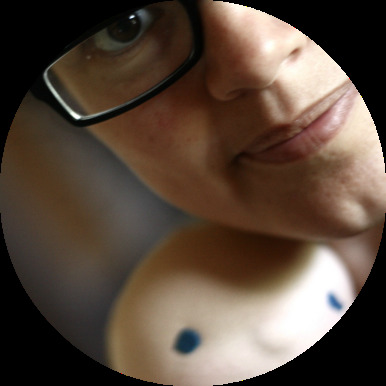 They always wake up bright eyed and smiling, I think they sleep quite soundly in their lavender-insufused chest, where I put them to bed every night. Waking up with bright eyes is one thing, but getting dressed is another. First one sock, then the other. Oh! look at how it stretches, how it hugs my feet, look at those stitches! (dolls are always very keen on noticing their clothing, as is one of their few possessions). Oh! you did sew the ric rac on my skirt, lovely addition! thank you!. Oh! it is nice linen, it feels soft, not like my blouse, that one is a bit stuffy and stiff. Lottie gets dressed, by Fig&me. Come on Lottie! We gotta get moving. The girls will wake up and then I will have to make porridge for them and clean the house, and go outside. And then your day of grand adventure will have to happen outside in the snow, and not in the attic. Do you mind finishing your monologue and getting dressed?. She gave me a big smile and off we went. To pull down the ladder that takes you into the very dusty attic. The light changed and all we could see was piled boxes and some shoes I chucked the other day while cleaning the entrance closet. She wanted to play being a pirate so she grabbed a big box and found herself a christmas tin with some ornaments, the scurvy crew she said. I told her the nutcracker seemed a bit cranky, not used to playing the part of a pirate, but she was having so much fun I don't think she even heard me. Playing in the attic, by Fig and me. I need a sword, a mighty sword! to fight the englishmen and get them off my ship!. Oh dear, now where am I going to find her a sword?, I thought. In the blink of an eye she found one herself, and was battling all denominations of soldiers, and some animals too. Lottie finds a sword, by Fig&me. Just make sure those soldiers don't break your candle, I mean your sword, Lottie. It could get messy with waxy bits all over the floor. She didn't hear me again, was already rummaging through another box, looking perhaps for an eye patch or a hat…I sure couldn't figure out what she was doing. Lottie finds a treasure, by Fig&me. But what is this? Who is this, most beautiful little person here, waiting for me? I should ever be so happy to have you. Yes of course I can take you out! No legs, you say? No matter. I have two and they should serve us both right. Of course I can take you with me, will you tell me your story? Mrs Cat wakes up after a dusty slumber, by Fig&me. A new best friend, by Fig and me. Oh but Lottie, that cat looks cranky. Must have dust mites and look at all those patches! it doesn't even have legs for goodness' sakes. Ok, ok. I won't say these nasty things in front of it…I mean, of her. Are you sure you want it? Well, alright. Let's go downstairs and maybe Mrs Cat can tell you her story. Lottie and her old best friend, by Fig&me. Mrs Cranky Cat, by Fig&me. Mrs Cat told Lottie all kinds of stories, while I made porridge. How she lost her legs in one go, and were never recovered. How she obtained all those patches and stitches, a hundred years ago (it seems cats have a different view of time). Lottie was enthralled hearing all about it, and every time her cat paused to reminisce she looked at me with the biggest eyes of wonder I have ever seen. I think Mrs Cat is out of the attic for sure, and she has made herself a new best friend. Lottie and Mrs Cat are looking for a home to belong to, one that hopefully won't store them in an attic for any number of years. Mrs Cat needs to recover and gain her eyesight. Lottie wants to take her places and show her how to drink from tea cups. We are ready to bid them farewell in the joint adventure they are about to begin. If you wish to bring Lottie and Mrs Cat into your home, please fill in the form below with your details and we will select a person at random to proceed to purchase them. 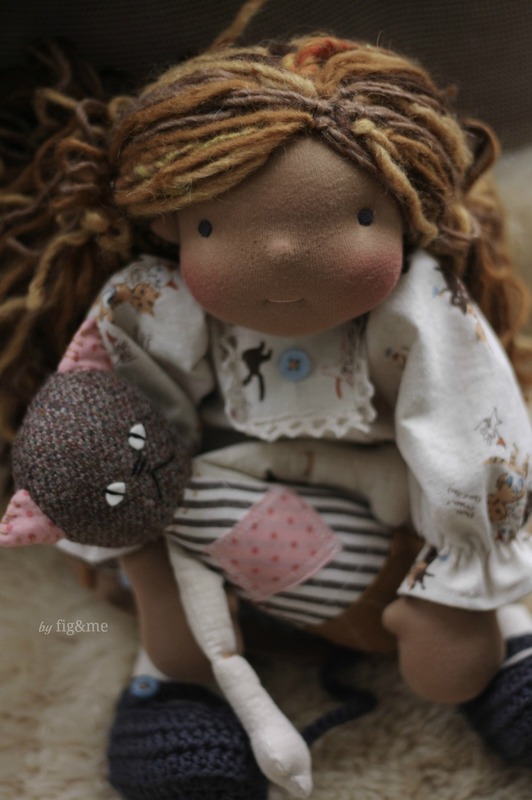 Lottie is a 13" tall natural doll, made with cotton and wool. Her hair was made with individual strands of wool attached to a cap, which can be styled and played with. She is wearing a linen blouse and skirt, cotton socks and underwear plus wool shoes. 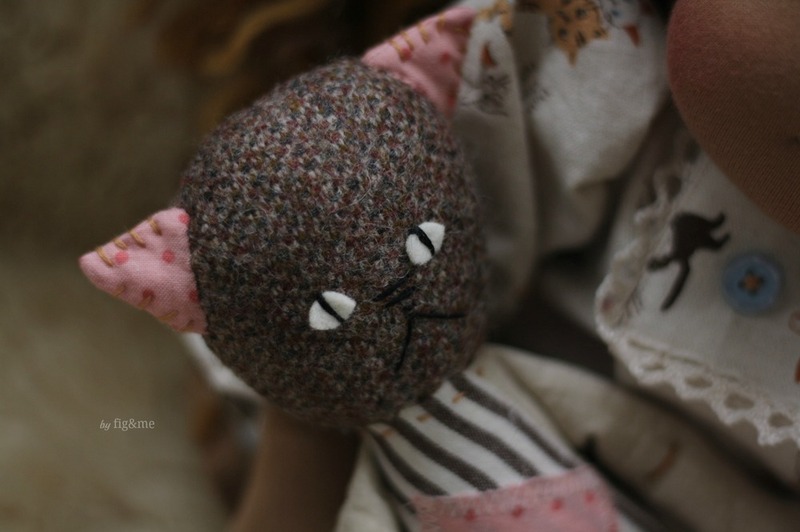 Her cat is made of linen and cotton fabrics, stuffed firmly with wool as well. They are a set of toys appropriate for a child 3+ due to small parts that can pose a choking hazard. Their price is $315 USD plus postage. We will leave the form open until tomorrow Sunday Nov. 24th at 8 PM EST and send a paypal invoice which must be paid on the same date. Care instructions will be emailed to you once I send them your way. —FORM HAS BEEN DELETED. SELECTED FAMILY NOTIFIED. THIS DOLL IS SOLD. Lottie and Mrs Cat by Fig and me. As you can see, Lottie is already making Mrs Cat go on all sorts of shenanigans. I wish everybody that wants to bring them home good luck, and I will see you tomorrow night. There are five more dolls in this collection, which also need to be taken into the attic to find their own special treasure. Have a nice weekend and stay warm!. Dec 2 Carla, the window and three pompoms.